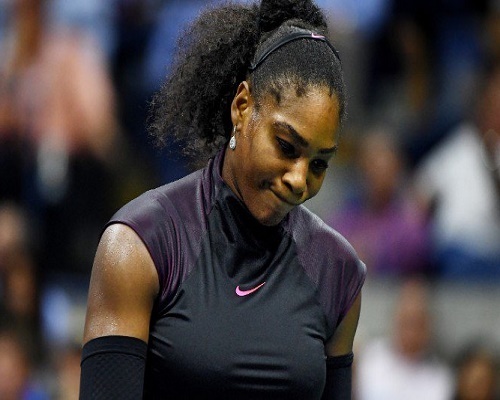 Serena Williams crashed out of the US Open on Thursday, her semi-final defeat to Karolina Pliskova costing her a shot at a 23rd Grand Slam title and a record 187th straight week at number one. Pliskova, the 10th-seeded Czech playing in her first Grand Slam semi-final, triumphed 6-2, 7-6 (7/5) and will face either Caroline Wozniacki or Angelique Kerber, the German who beat Williams in the Wimbledon final and who will supplant the American atop the summit when the new world rankings are released on Monday. “I don’t believe it,” said Pliskova, who had never made it past the third round of a Grand Slam in 17 prior attempts. “I knew I had the chance to beat anyone if I played my game. I am excited to be in the final and to beat Serena as she is such a great champion. Williams said she had been hampered by a sore left knee since earlier in the tournament. Although it was a distraction, she said Pliskova earned her victory. “Karolina played great today. I think if she had played any less then maybe I would have had a chance,” said Williams, who with one more Grand Slam title will move out of a tie with Steffi Graf for most in the Open Era. Pliskova, who survived a match point en route to a fourth-round victory over Venus Williams, was nearly betrayed by her nerves as up 3-0 in the tiebreaker she produced three errors, including a double fault. Williams led 4-3 and 5-4 in the decider but couldn’t hang on, Pliskova taking it when Williams delivered her sixth double-fault of the match. While Williams’s serve has long been reckoned the most powerful weapon in women’s tennis, 11th-ranked Pliskova came into the contest boasting a tour-leading 439 aces. In a duel of power-hitters where protecting serve was crucial, Pliskova gained the upper hand with a break for 2-1 in the first set and Williams gave her a chance to serve it out with a shocking seventh game that started with a double-fault and continued with three errors to grant Pliskova a 5-2 lead. Pliskova pocketed the set in 26 minutes without facing a break point. Williams was under pressure immediately in the second, fending off a break point in the opening game. When her booming opening serve in the third game was called a let she indulged in a verbal jab at the chair umpire, but steadied herself to hold. She was on the ropes again, though, surrendering a break when her lunging forehand found the net to give Pliskova a 3-2 lead. Pliskova responded with a nervy service game of her own, a double fault and two forehand errors giving Williams a break back for 3-3. Williams survived two double faults to start the next game. Pliskova retrieved two massive shots from Williams to win a rally for a break point, but Williams reeled off the next three points to hold, and from there they duked it out to the tiebreak.